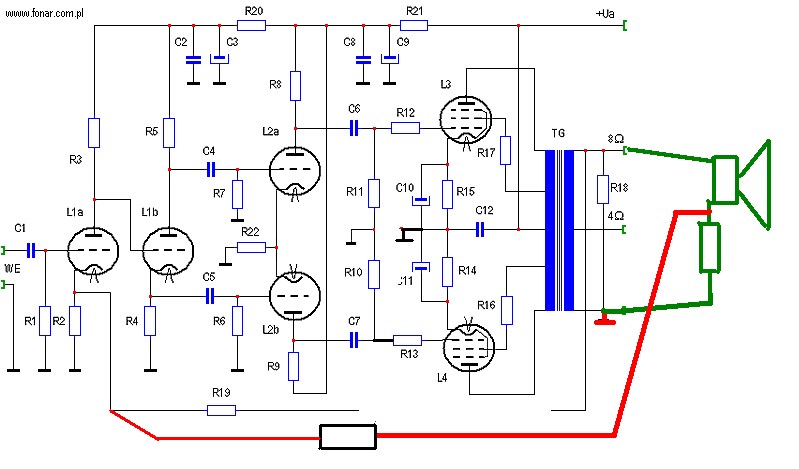 Please kindly look at this following idea of how to convert a good old Williamson clone tube amplifier, a classical push-pull amp, based on the EL34 tubes, … from a voltage driven amplifier into a transconductance amplifier. Any comments, suggestions, kindly welcome. The design goal is to achieve an output impedance close to infinity. Or in other words: a damping factor as close to ZERO as possible. The (green) resistor under the speaker is …. hmmm … let’s say that it is a 0,56 Ohms, 10 Watt graphite rod. The load will receive a Zobel network (not shown on picture): 18 ohms/1Watt + 22nF. The feedback resistor (the black one) will be established experimentally, but a good guess for a starting point would be somewhere around 1/16-th of the “initial” value of this resistor, as normally published for this position within the feedback loop. 0,5 ohms / 8 ohms ~= 1/16. As we have a potentiometric divider of sorts, comprised of the 8 ohm impedance and the 0,5 ohm resistance, we should obtain 1/16-th of the feedback voltage (current !!) as previously. So the serial feedback resistor, in consequence, should range in the whereabouts of 1/16-th of it’s previous value. 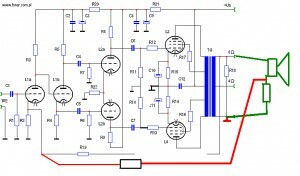 Am I crazy or will this be a Williamson CURRENT DRIVE amplifier ? I do not want to drive my speakers with controlled voltage. I want to drive them with controlled CURRENT.